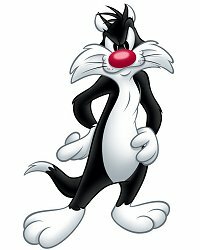 Today is the birthday of one of the legendary characters of Looney Tunes and Merrie Melodies: "Sylvester J. Pussycat Sr.". Perennially hungry, she has always been obsessed with capturing her prey, including the omnipresent canary yellow Titti or the mouse Speedy Gonzales, her name derives from "silvestris", the scientific name of the wild cat. Born from the mind of Friz Freleng along with other Warner Bros. designers Robert McKimson and Chuck Jones, it appeared the first time on March 24, 1945 in the episode "Life with feathers". His first voice was that of the legendary Mel Blanc.